I've taken my walk, juiced my veggies, eaten my Joe's O's with fresh blueberries, and popped my vitamins. Now for a cup of decaf while I attempt the crossword. What does your morning look like? Do you have a ritual before you tackle the day? Just woke up and am off to walk to dogs before the ground gets too hot- which will be by 7am! Looks so peaceful! Our morning routine consists of getting the chickens water and food, checking for tomatoes that are ready and then enjoying some hot cocoa in our back breakfast nook! Looks like a great morning start. I take the pups out, eat breakfast and then do my Pilates machine. 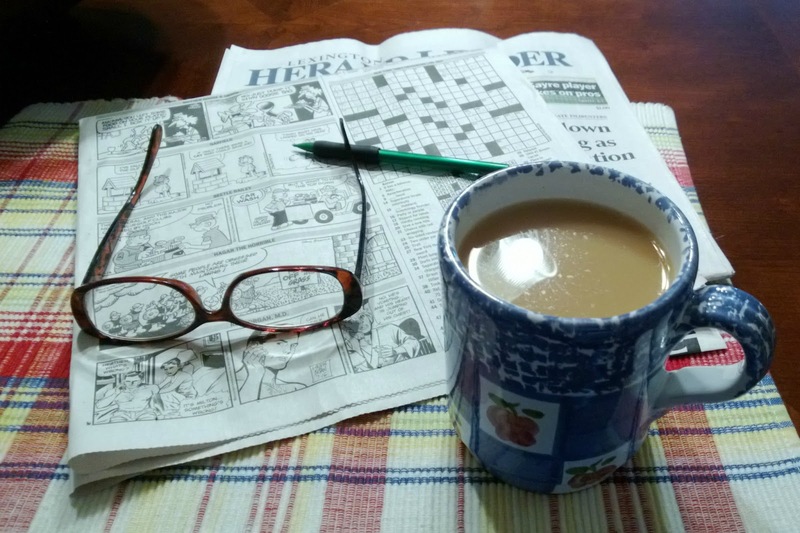 Nothing better than starting the day with coffee and a crossword! My cat wakes me at around six each morning (even on the weekends!) for her breakfast. My morning begins by petting the three cats that currently live at The Little White House. Best way to start a morning!